H.P. Lovecraft, aside from devising his own works in his Cthulhu Mythos cycle, also collaborated in his day with many younger writers of the uncanny and eerie. Available for the first time in paperback, this collection features stories to which the master of horror added his own ingenious touch. 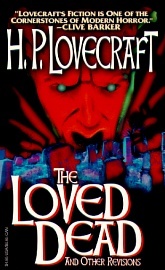 The Loved Dead and Other Revisions. By H.P. Lovecraft. New York: Carroll & Graf Publishers; 1997; ISBN 0-7867-0445-4; Paperback.